Article from "Folk Art Messenger"
The pressure of economic growth, land speculation and the seemingly endless drive to conform to zoning and building codes have often doomed folk art environments to the landfill or the bulldozer. When groups attempt to save an endangered site, complex problems arise. A recent example in Wisconsin illustrates how solutions can be reached if neighbors, concerned preservationists and city governments work together. The home of Sid Boyum (1914-1991) is on a quiet street next to a factory in Madison Wisconsin. 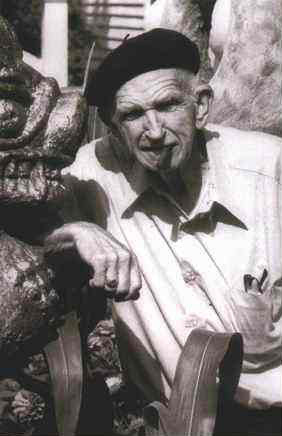 Boyum was a talented industrial photographer, bon vivant, neighborhood character and artist. Boyum loved to live life at the edge, and he did. Boyum was attracted to the unusual, the fantastic and the eccentric. He enjoyed the company of friends and gave frequent backyard parties. His fishing sketches appeared annually in the Wisconsin State Journal at the opening of fishing season. When Boyum began to embellish the interior of his house is not known, but works of art began to spill out into his small suburban yard around 1973, the year he retired. Early on, he created an oriental tea garden and pavilion, then a Tooterville trolley car and a startling Mouth of Hell. 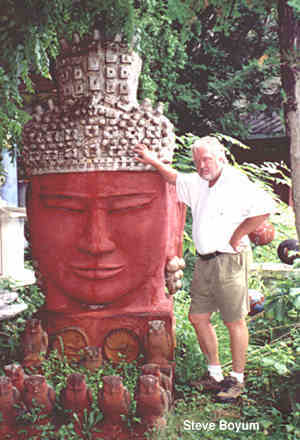 Eventually, he produced nearly 70 decorated concrete and wood sculptures in his yard --so many and so densely packed that friends had difficulty moving about. His figures included an Indian goddess of love, a giant head of Buddha, a sphinx and the much-loved Polar Bear Chair. The chair is between the sidewalk and the front porch and is still the way many neighbors identify the house. At Boyum's death in 1991, the property was inherited by his son, Steve. 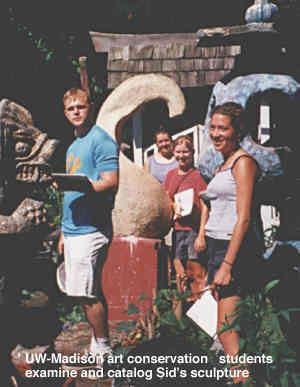 Beginning in 1992, students from the University of Wisconsin-Madison conducted a preliminary sculptural survey as part of the Save Outdoor Sculpture (SOS) project to document sculpture throughout the state of Wisconsin. Steve Boyum granted permission to examine the site and assisted in the effort. Later, neighbors and city officials began to take an interest in the site, as much for the art as for the fact that this sculpture could pose a danger to the public. However, the sculpture's value as a unique art statement was recognized by everyone who saw it. Viewers were amazed at what Boyum had been able to produce in his backyard--a combination of art and architecture. But what to do with it? Because of the dense arrangement of the pieces, it was impossible to make it accessible to the public, much less to meet requirements of the Americans with Disabilities Act. In the mid-1990s, a small group of concerned neighbors put forth the idea that pieces could be sited throughout the neighborhood, in parks, on bike path clearings and at traffic circles. In this way, more people would be able to enjoy Boyum's work. Because Boyum had been a longtime resident of the neighborhood and still was remembered fondly, a support organization called Friends of Sid Boyum Sculpture was established, with Steve Boyum as its head. If the site could not be saved as it was, Boyum's spirit still could live on in each sculpture placed around his neighborhood. However, community participation was vital to the success of this preservation project, because support for public art in Madison often has provoked controversy. Neighborhood residents were invited to vote on the fate of the sculptures--first to select favorites and then to propose new locations. Large photographs of the sculptures were displayed prominently in the storefront of an architectural office in the center of the neighborhood beside a 24-hour, all-weather ballot box stocked with opinion survey forms and pencils. For the second round of voting, computer mockups of the favorites, were shown superimposed on the chosen locations to allow neighbors to feel confident about the sculptures 'appearance at the new sites. The poll was advertised in the local newspaper, and hundreds expressed opinions. The response from neighbors was overwhelmingly positive, and the committee had the written votes to prove it. This support made it much easier to secure support from the mayor and council, who were intrigued by the idea of democratically chosen public art. Over a three-year period, meetings were held with neighbors, city officials and representatives from building, parks and zoning departments to explain the project. Early in 1999, the group was encouraged by the city to apply to Madison's newly created Community Enhancement Grant Program for funding to assist to conserving and moving the heavy sculptures. More meetings and hearings were needed to consider placing sculpture on city property, this round involving the Board of Estimates, the Urban Design Commission , the Privilege in Streets committee, the Division of Public Works, the Parks Department and the City Arts Commission. Local alderperson Judy Olson played a crucial role in pushing the project forward. In the summer of 1999, as part of a University of Wisconsin-Madison conservation class, the sculptures were photographed and measured, and an accurate inventory was made. It was important to examine the condition of each sculpture, because the city insisted that one of the prerequisites for accepting the gift was the establishment of a maintenance budget. With seed money from donations and the sale of some of the pieces, and endowment fund to be used for maintenance was created. The City of Madison accepted 13 Boyum sculptures, the largest single donation of public sculpture in the city's 160-year history. The fulfillment of the committee's efforts was recognized in a public ceremony by the mayor and the city council on October 5, 1999, as exemplary work in bringing people, places and art together to improve the quality of life in Madison. The sculptures will be sited around the Atwood east-side neighborhood next summer. A plaque will explain the significance of each piece. In addition, a brochure and a postcard depicting each work will explain its history and relevance to the community. Much more work must be done if the whole of Sid Boyum's site is to be preserved. To date, the project will preserve only a fraction of Boyum's many outdoor sculptures and does not address the profusion of works still in his house. Anton (Tony) Rajer is a professional art conservator, specializing in the preservation of folk art. he holds degrees from Harvard University and the University of Wisconsin. Lou Host-Jablonski, AIA is an architect affiliated with the non-profit Design Coalition, which specializes in community-based projects. He has been involved from the beginning in the effort to preserve the Sid Boyum site. He was educated at Marquette University and the University of Wisconsin-Milwaukee.